Villoresi's 340MM at 1953 Mille Miglia with Touring body and the winning car at 1953 BRDC International Daily Express Trophy Race. Since 1954 with Scaglietti body. Developed during a period of triumph and passion, they personify every aspect of Ferrari's road racing legend. While development of Colombo's original small block V12 continued in a variety of various displacements, significant horsepower gains stagnated in early 1952. This was the final year of the "1.5 liter supercharged 4.5 liter naturally aspirated" Grand Prix Formula, Ferrari monopostos dominated nearly every race entered. Although sufficiently developed and a proven winner, the 1953 season saw a completely new application of the Lampredi "big blocks". Series production of the 340s consisted of a total of 37 cars with a chassis number range from 0082A to 0350 AM. 23 were 340 Americas with distributor ignition 220bhp engines, and four were 280bhp 340 Mexicos, also with distributor ignition. The ultimate evolution of the model, and the most powerful road car built by Ferrari to that point, was the magneto-equipped 300bhp 340 Mille Miglia – of which just ten were built. They established an outstanding competition record both for the factory and their many private owners. Of the ten 340 MMs built, four were spyders bodied by Vignale, four were berlinettas by Pininfarina, and finally, two carried spyder coachwork by Touring. In 1953 the adaptation of the all new Lampredi 4.1 and later 4.5 liter Grand Prix derived "big block" engines took Ferrari in a completely new direction. Not simply a further development of the early 166 and 250 MM, the new 340 MM shared only it's earlier sibling's namesake. The engine design itself had already been proven successful in Grand Prix competition over the previous three years. Quick development and rapid success saw a bore and stroke increase resulting in a total displacement of 4.1 liters with a final bore increase of 4mm bringing total displacement up to 4.5 liters. 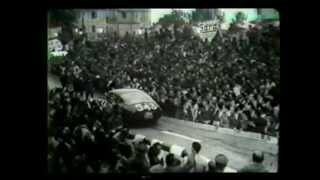 Introduced in 1953, the 340 Mille Miglia coincided with the inauguration of the World Sports Car Championship. Consisting of seven events, the new 340 MM would participate in each round, reaching victory after victory in an unparalleled fashion. As a factory team car, the Ferrari 340 MM had a brilliant yet relatively short career. The cars were successful from the start, winning the Tour of Sicily with Luigi Villoresi and the Mille Miglia with Count Giannino Marzotto in April 1953 plus the Daily Express Trophy race at Silverstone in May. The 340 MMs were then sold to private clients and entered in a number of races, scoring many successes, particularly in America where the large displacement cars were in strong demand. Chassis 0294 AM, made its debut at 1953 Mille Miglia. One of the few Scuderia Ferrari Factory Team 340 MMs completed, it would be driven in its debut race by Villoresi, who would have Piero Cassani on board to assist with navigating duties but had an accident. On May 9th, 1953, Mike Hawthorn was entrusted with 0294 AM at the BRDC International Daily Express Trophy Race being held in Silverstone, England where won the race. 0294 AM was one of just two 340 MM Spyders given initial coachwork by Carrozzeria Touring. Although dated in design and appearance, the five year old "Barchetta" style coachwork was used for a final time in 1953. On July 6th, 1953 0294 AM was purchased by the famous Swiss gentleman driver, Hans Ruesch, for 8,600,000 Italian Lire and registered on Modena license plates "MO 30111". Ruesch would race 0294 AM on four separate occasions in 1953. His first race with the new car occurred at the British Empire Trophy, Isle of Man Race where he placed third overall. A photograph of Ruesch and 0294 AM at this race is pictured in the 1953 Ferrari yearbook. On July 12, he entered the car in the Vue des Alpes hillclimb where he easily placed first overall. In 1954, the car was returned to Ferrari and given that year's complement of 375 MM upgrades, including a new gearbox, rear differential and brakes. It is believed that at this time the engine was rebuilt with a total displacement of nearly 4.4 litres. A new more contemporary body by Scaglietti was then fitted to replace the now highly dated and damaged touring body, making it one of only two 340/375 MMs finished with such coachwork. After repairs and modifications were completed by Ferrari, the car was resold to Luigi Chinetti.